This weekend, my mother and my dear friend hosted what I like to call a bridal tea in my honor. You see, Fiancé and I have decided to forgo any gifts for our wedding, but my lady friends still wanted to have a day to get together and celebrate my engagement. What better way, I thought, than to have an afternoon tea? When I was a small girl, my mother used to have tea parties with me at least a few times a week. I would come home from kindergarten in the afternoon and instead of just making a snack, she would lay out little sandwiches, some sweets, and a pot of tea. She even had an adorable collection of miniature tea sets for the occasion, her crowning glory (and my inheritance) being the Brambly Hedge miniature tea set. I remember going to antique stores trying to find one of every season in the set. So I knew my mother would host a wonderful tea. I also asked my friend to help her because she makes delicious homemade bread and what could be a better accompaniment to my mother’s amazing baked goods than tea sandwiches made on homemade bread? And the afternoon tea time slot was perfect for a celebration, as I still had one more evening show of Pygmalion to perform, and we would all be finished in time to get to the theatre. The celebration was beautiful, and we had far too much food, which was all delicious. 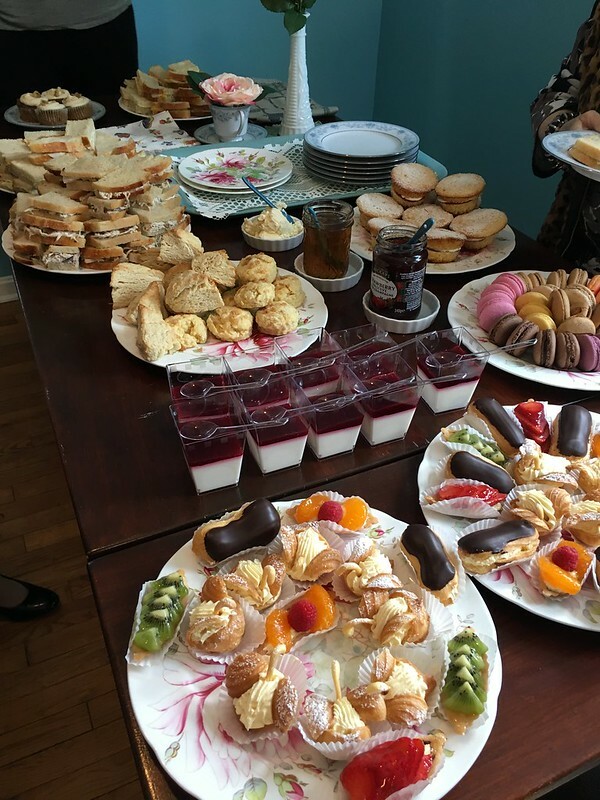 I did make a batch of my own famous cream scones, as well as a batch of mini Victoria sandwich cakes to add to the celebration, but by and large, the spread was done entirely by the two hostesses and I got to sit back, maybe fuss over a pot of tea. My mother even made miniature panna cotta with a raspberry topping in their own individual cups, as well as getting a box of macarons from a local French bakery and a box of assorted mini pastries from the bakery we’ve frequented since I was young. Fiancé left for the afternoon so we ladies could flutter and coo to our hearts’ content. It was lovely to see this quite eclectic group of my friends and family (and soon-to-be family) come together and socialize. The director of Pygmalion even brought a silly hat with a veil that I could wear, as the bride. It rather felt like my entrée into the final stretch of my wedding planning, honestly. With Pygmalion at an end and the wedding looming next month, I have the last finishing touches to finish up before the big event. And what better way to get back into the swing of planning than with a cuppa tea? With that, I suppose I shall leave you with my recipe for mini Victoria sponges, which are not so much my recipe as a recipe my castmate shared from her days in home economics in Wales. Preheat the oven to 375 F. Line a cupcake tin with non-stick paper cases. I like these the best. Weigh three large eggs in their shells. Measure out the same weight each of self-raising flour, granulated or caster sugar, and soft unsalted butter. Lay the eggs in a bowl of hot water to come to room temperature. Beat together the butter and sugar until combined and fluffy. Add the eggs, one at a time, beating well, and about a teaspoon of vanilla extract. Add the flour and beat until combined. Add milk a tablespoon at a time until the batter is a soft dropping consistency, about like frozen custard or soft-serve ice cream. Spoon into the cupcake tin, filling about 2/3 full. Bake for 13-15 minutes, or until golden around the edges. Let the cakes cool in the tin until the tin is cool enough to handle without a potholder, and then remove them to a cooling rack to cool completely. Victoria sponge is very delicate when warm, but quite sturdy once it cools, so handle warm sponges gently. When they are cool, split them in half with a sharp serrated knife. Fill with jam (I like raspberry) and lightly sweetened whipped cream. Dust with icing/powdered sugar to serve.